I've never been a big brunch person, particularly those where the approach seems to value quantity over quality. $50-60 and up just strikes me as a goofy amount of money to spend on the first meal of the day and I don't like feeling obligated to gorge myself like a goose getting prepped for foie gras to get my money's worth. So it's nice to find there's some new brunch options that are a lot more my speed. BLT Steak on Ocean Drive is unveiling a $24 prix fixe Sunday brunch featuring, among other things, a "SoBe Burrito," ham & cheese croque monsieur or Black Angus burger with fries, along with a complimentary bloody mary, mimosa or white peach bellini. But what really got my eyes to light up was the "BLT Popover Poached Eggs," with spinach, ham, bacon, bechamel and gruyere cheese over one of their awesome popovers. Not quite new but another good option on South Beach is the Sunday brunch at Talula, which offers a spread of salads and sweets that covers the entire bar, several different breakfasty and more savory hot items, as well as a choice of egg dishes cooked to order (I like the egg and chorizo sandwich, and the benedict with a tomato hollandaise), for only $29. Somehow their covered outdoor patio always seems a couple degrees cooler than the rest of the Beach. Further north, I've not tried it yet but have heard good things about the Sunday brunch at Neomi's in the Trump Miami in Sunny Isles, especially if Chef Mike is doing some of his New Orleans style cooking. It's a little pricier at $39 but that includes access to their pool and beach too. Meanwhile, in what may be the category-killer, Michael's Genuine Food & Drink now has a Sunday brunch menu, which they'll be starting up on October 25 according to a post on Chowhound (I've not yet confirmed that tidbit of info) which I've now confirmed. The MGF&D brunch menu is actually in large part a clever re-purposing of many of the regular lunch and dinner menu items. There are some new things, like a duck confit hash with a poached egg, or a wood oven roasted duck egg in spicy tomato sauce with chickpeas and queso fresco. But some make their way over pretty much unaltered, like the wood oven roasted double egg yolk, the burrata and tomato salad, the duck rilletes, and the rabbit pate, and all the "Snacks." Still others subscribe to the sound theory that everything is better with an egg on it, such as the roasted pork shoulder with cheese grits and a parsley sauce - with a poached egg. Then there's a whole section of "Sweets" where Pastry Chef Hedy Goldsmith gets to show her stuff, with homemade pop-tarts, doughnuts, or "Hedy's assorted favorite childhood treats," along with more customary morning fare like lemon ricotta pancakes and almond French toast. The real kicker? There's almost nothing on the menu over $10. Surely that won't last. Edited to add: Here's the details on the MGF&D brunch. It's starting Sunday October 25, hours will be 11am - 3pm, and the menu, as linked to above, is on the website. I'm not a brunch fan for the exact same reasons you mentioned. That being said, I completely agree about the MGF&D brunch. 11-2??? can anyone confirm the start date and time? I'm all about Sunday brunch (or at least big breakfast) but usually avoid the pay and gorge fests. 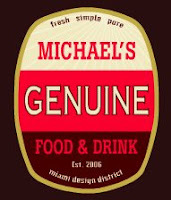 There's precious few options in MIA and the quality of Michael's menu looks to make it a contender from the get go. My bday weekend made up of a Cobaya dinner and Michaels brunch (res are being taken on Opentable) eases the pain of my bday falling in a Monday. Chowfather - deets are now confirmed and I've updated the post accordingly. I'm guessing from the prices they are mostly small plates... maybe 2-3 pp? On a side note, F urbandaddy!!! It's tough to stay underground in Miami, where everything's at sea level. I went to BLT today with some friends. For $24, you can order one dish from the prix fixe menu and one beverage - a mimosa, bellini, bloody mary or coffee, juice, etc. A couple of dishes, like the steak and eggs, carry surcharges. I ordered the popovers and coffee. My husband and a friend ordered the filet mignon hash with eggs ($15) from the blackboard specials menu. 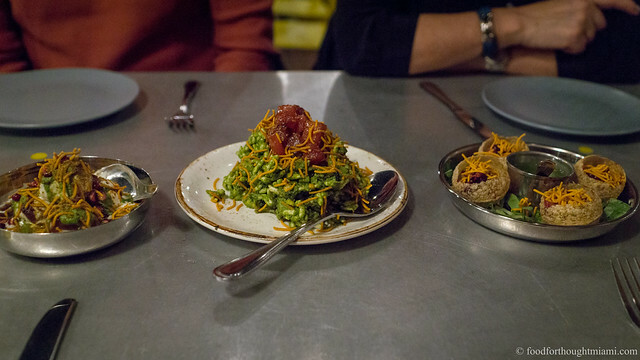 While the food was good, it seems like some of the other places offer more value. I mean, had my husband ordered a bellini, he would've paid the same $24 that I paid for popovers and coffee.